Due to my history of miscarriage, I was very wary about buying baby goods, not for superstitious reasons, but because I was scared that I would have loads of stuff to deal with if things went wrong. However at 20 weeks I bought a posh changing bag and a few newborn clothes. The week before Joseph was born we were given some John Lewis vouchers and we bought a few toys and a bouncy chair, but that was it. I am glad, looking back, that we didn't go out and buy loads as what we did buy was different, I think, than if we had had a termie. Here are my favourite things we bought! 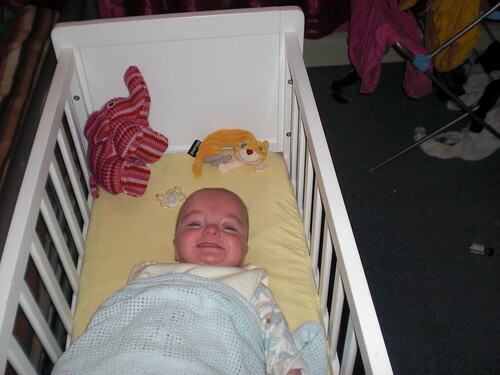 This was Joseph's Pure crib purchased from Mothercare. We didn't feel comfortable with a moses basket, as we though the cat might use it, and I wanted him in something that was firmer and more like the cot he was used to in hospital. It made me laugh when I went to buy it, the salesman tried to convince me he'd only be in it six weeks. I smiled and said "no I think it will last longer than you think". He was in it until he was one! This is Joseph's bouncy chair. I found it so useful and am really glad I bought the one I did. My criteria was bright and non gender specific, and quite simple. It did have a toy bar, but nothing flashy or loud. We used it loads in Joseph's first year, he couldn't sit unsupported until 12 months, so it was great to have, and I'm glad I got that one. It's a Cosatto and I adore their products! 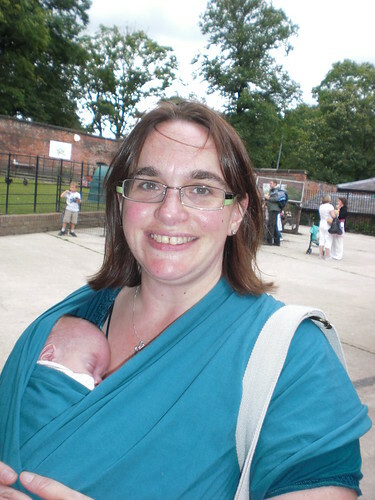 I started looking at slings when I was pregnant, and found a great slingshop in Hebden Bridge (which I think now has gone) and had a very creepy conversation about the benefits of babywearing and premature babies! I really wanted a carrier style, but she convinced me that wrap slings are much better, and I am a complete convert. Joseph was always so snuggled and looked so safe in his sling. This particular one is a Kari-Me. Three for the price of one in this photo! We bought the car seat at the 11th hour, just before Joseph came home. I was pretty sure I wanted this one, as I knew it was compatible with a number of different pram systems. In a perfect world, I would have used a proper pram or carry cot, but for my husband, with his disability, this was the ideal solution for us. Also in the picture is the Quinny Zapp. 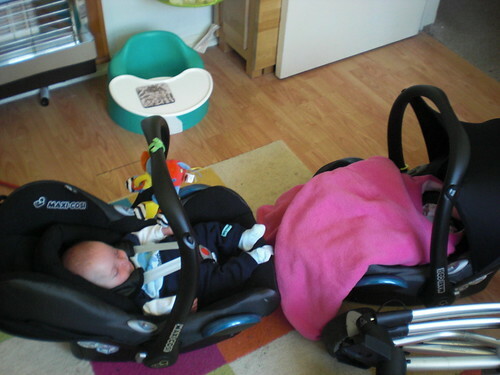 As I baby wore it didn't worry me using the car seat on the pram base as he was never it for that long, and we found it very convenient. The third item is the Bumbo seat. I kind of thing that babies shouldn't be encouraged to sit until they are ready, however for premmies who are weaning on actual age, it is much easier if they are sitting up straight and less of a choking risk. I used to plump up the Bumbo with muslins. The last picture is our high chair, another appearance by Cosatto . I got the highchair once Joseph was 7 months, kindly purchased by the in laws. I had quite a criteria. Adjustable height, 5 point harness, washable cover, and reclinable. I also didn't want to spend an absolute fortune on it. This one fit the bill and was fabulous. The only downside was the size of the base but the new Cosatto 3 sixti is much smaller, so they have certainly listened to feedback from parents. What baby items could you not live without? * Totally non sponsored post! I was going to buy the cosatto bouncer for Gill but it got terrible feedback on amazon, I settled for a simpler one in the end. I second the bumbo. 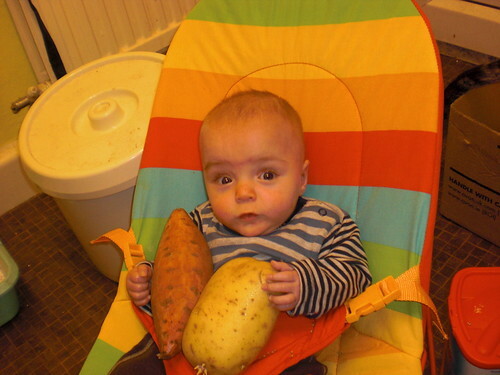 We used ours loads as whilst Eloise was a good size baby and we waited until a week before 6 months to wean, she looked so tiny in the highchair we'd bought. 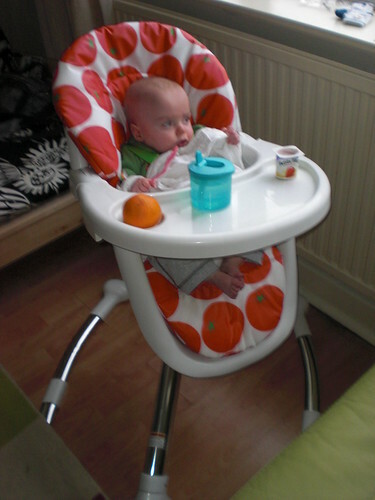 The bumbo was fab on the breakfast bar with the little tray on it for first foods. It's also fab to sling in the car to take out n about. We used it at a wedding, a birthday party, and numerous Pubs/eating places. She still fits in it now and we will occasionally take it out or away with us in case somewhere doesn't have a high chair. Oh that's hilarious! I've just read the reviews! Joseph was in it from 5lb and it was fine! We bought it before those reviews were published. I loved it, I still kiinda miss it! Even though a few insane people thought it was a potty!